Willberg-Keyriläinen, P., Ropponen, J., Lahtinen, M., and Pere, J. (2019). "Improved reactivity and derivatization of cellulose after pre-hydrolysis with commercial enzymes," BioRes. 14(1), 561-574. Reactivity is an important parameter when considering the chemical modification or dissolution of cellulose. Different pretreatment methods affect cellulose reactivity by decreasing its degree of polymerization (DP) and crystallinity. In this study, the molar mass of cellulose was decreased via enzymatic pretreatment. Three commercial endoglucanase-rich products were tested. The target was to reduce the viscosity of the pulp to below 200 mL/g and, thus, increase the reactivity of the cellulose. For comparison, cellulose was also pretreated with ozone, and the effects of each pretreatment method on crystallinity and monosaccharide composition of the resulting pulps were investigated. Both enzymatically treated and ozone-treated pulps were esterified using homogeneous and heterogeneous methods, and the degrees of substitution for these treated pulps were much higher than the esters when the untreated pulp was used. Cellulose esters from the pretreated pulps formed films with good mechanical properties by solvent casting. Cellulose is the most abundant renewable polymer on the earth, and it is also recognized as an important raw material for several industries such as paper, textiles, foods, and cosmetics. Cellulose can be described as a linear polysaccharide consisting of D-glucose units linked together with β(1→4) linkages. Cellulose hydroxyl groups form strong hydrogen bonds and a resistant microfibril network, which give cellulose its natural strength and reactivity (Edgar et al. 2001). Reactivity is an important quality parameter when considering the chemical modification (e.g. esterification) or dissolution of cellulose. Reactivity is affected by chemical, structural, and morphological properties of cellulose fibers, such as chemical composition, crystallinity, and degree of polymerization (DP) (Krässig 1993). Different pretreatment methods affect cellulose reactivity by decreasing its DP and crystallinity. Decreasing the cellulose molar mass to increase its reactivity can be performed in many ways, such as using chemical or enzymatic hydrolysis (Carvalheiro et al. 2008; Kumar et al. 2009; Bensah and Mensah 2013). Acid hydrolysis (e.g. with hydrochloric acid (HCl) or sulfuric acid (H2SO4)) is a well-known treatment method to completely degrade cellulose (Kumar et al. 2009) or adjust cellulose molar mass (Funahashi et al. 2018). However, concentrated acids are corrosive and toxic, meaning that corrosion resistant reactors have to be used, which makes acid pretreatment processes quite expensive (Satyamurthy et al. 2011). Acid hydrolysis of cellulose is used to remove amorphous regions of cellulose and hemicelluloses while leaving lignin and the crystalline domains of cellulose intact (Bondeson et al. 2006; Bensah and Mensah 2013). Some alkaline chemicals (e.g., sodium hydroxide (NaOH) and potassium hydroxide (KOH)) can also be used for the pretreatment of cellulose. Alkaline treatments extract hemicelluloses and lignin from pulp and therefore increase the accessible surface area of cellulose (Bensah and Mensah 2013). Ozone is an interesting reagent for chemical hydrolysis, since it is a powerful oxidizing agent, reacting easily with most organic materials, including lignocelluloses. Ozone reacts directly with carbohydrates, resulting in the cleavage of glycosidic linkages. Because of this, ozone is commonly used, for example, in the chemical pulping process for the adjustment of pulp viscosity. The advantages of the ozone treatment are that treatments occur at normal pressure and room temperature (Eqra et al. 2014; Travaini et al. 2016) and that ozone treatment does not leave toxic residues in the treated material (Silverstein et al. 2007). A drawback of ozone pretreatment is that the large amount of ozone required makes the process quite expensive (Kumar et al. 2009). Ozone pretreatment has been used in many applications. In the paper industry, ozone has been widely used for pulp bleaching because of its high delignification efficiency (Roncero et al. 2003) and in dissolving pulp production for the adjustment of pulp viscosity (Sixta 2006). Cellulose molar mass can also be decreased in a controlled manner via ozone pretreatment (Willberg-Keyriläinen et al. 2016). Ozone pretreatment has also been reported as an effective method for total enzymatic hydrolysis of agro-based residues and waste papers (Kojima and Yoon 2008; Eqra et al. 2014). Enzymatic treatment is a widely used method for hydrolyzing cellulose to soluble sugars, which can be used to produce fuels and commodity chemicals (Himmel et al. 2007; Kumar et al. 2009; Humbird et al. 2011). Cellulases are a group of enzymes responsible for the hydrolysis of cellulose. They can be divided into three main groups: endoglucanases (EC 3.2.1.4), which hydrolyze randomly accessible glycosidic bonds in, mainly, the less-ordered, amorphous parts the cellulose chain; exoglucanases (EC 3.2.1.91), which hydrolyze the cellulose chain from either the reducing or the non-reducing end, producing cellobiose; and β-glucosidases (EC 3.2.1.21), which convert the resulting cello-oligosaccharides and cellobiose units to glucose (Bhat and Bhat 1997). Besides total hydrolysis with synergistic action of the above mentioned cellulases, targeted modification of cellulose fibers (e.g., in textile and pulp and paper applications) can be realized by individual cellulases exhibiting specific modes of action and liberation of limited amounts of sugars (Pere et al. 1995; Heikinheimo et al. 1998; Liu et al. 2000). Monocomponent cellulases are widely used within the forest industry for either enhancing a variety of process steps (e.g., pulp bleaching or refining) or for improving product quality (Koivula et al. 2012). The finishing of textiles is another example of industrial use of cellulases for the targeted modification of cellulose (Araújo et al. 2008). Typically enzymatic treatment is an environmentally friendly process because of its mild conditions, e.g., with respect to temperature and pH. In addition, no solvents and chemical reagents are needed (Tibolla et al. 2014). This research examined the use of enzymes to decrease the molar mass of hardwood pulp in a controlled manner. Three different commercial endoglucanase-rich products were tested with the target of reducing the viscosity of the pulp below 200 mL/g and, thus, increase the reactivity of the cellulose. Furthermore, enzymatic treatment was compared with ozone treatment, and it was determined if it is possible to change the ozone pretreatment method to a more environmentally friendly method. The effect of the pretreatment method on crystallinity and monosaccharide composition of the pulps was investigated. In order to find differences in reactivity due to the different pre-treatments, homogeneous and heterogeneous esterifications were performed, and the resulting films were tested for their mechanical properties. Bleached birch kraft pulp from a Finnish pulp mill (MetsäFibre, Äänekoski, Finland) was used in the experiments. The enzymes were kindly provided from commercial sources; FiberCare R from Novozymes (Bagsvaerd, Denmark), Ecopulp R from AB Enzymes (Rajamäki, Finland), and Maximyze 2535 from Buckman (Memphis, TN, USA). Cellulase activity of the enzyme preparations was analyzed using hydroxyethyl cellulose (HEC) as the substrate, according to Ghose (1987). Protein content of the enzymes was analyzed by the Bio-Rad analysis kit using the Lowry method (Lowry et al. 1951). The values of cellulase activity and protein concentration are summarized in Table 1. All other reagents and solvents were purchased from Sigma-Aldrich (Helsinki, Finland) in the highest purity grade available and were used as received. The enzymatic treatments of the pulps were performed in a Farinograph reactor (Brabender GmbH, Duisburg, Germany). In order to adjust the desired pulp consistency (25%) while also obtaining a homogeneous distribution of the enzyme, the enzyme was first diluted into a small aliquot of 0.1 M sodium acetate buffer (pH 5) and then sprayed onto the pulp. The enzymes were dosed as mg protein/g oven dry pulp and the dosages are shown in Table 2. The enzymatic treatments were performed at a consistency of 25%, at 50 °C for 2 h using a mixing speed of 60 rpm. After the enzymatic treatment, the samples were boiled for 15 min to inactivate the enzyme. The treated pulps were filtered and washed thoroughly with an excess of distilled water and stored at 4 °C before use. The enzymatic hydrolysis was monitored by analyzing the liberation of soluble sugars in the filtrate. Total reducing sugars were determined using the dinitrosalicylic acid (DNS) method as described by Bernfeld (1955). The cellulose pulp was treated with ozone according to a previously reported method by Willberg-Keyriläinen et al. (2016). Ozone treatment of the pulp was carried out at 25 °C using 12 wt.% cellulose consistency and ozone flow of 190 mg/min. Thus ozone consumption was 35 mg/g of pulp. The intrinsic viscosity of the pulps was determined by the standard ISO 5351-1 (1981) using cupriethylenediamine (CED) solution as the solvent. The efflux time of the pulp sample was determined with a viscometer (PSL Rheotek RPV-1, Granger, IN, USA). The measurement program of the viscometer automatically produces the intrinsic viscosity value of the sample. The relative molar masses of the pulp samples were determined by size exclusion chromatography (SEC) in 0.8 % LiCl/DMAc eluent with MiniMix columns and a Waters 2414 Refractive Index Detector (Waters, Milford, MA, USA). The molar mass distributions and average molar masses (Mn, Mw) were calculated against Pullulan Standards (6100 to 1,600,000 g/mol). Both before and after the treatments the pulps were analyzed for chemical composition. For analysis the pulps were air dried and ground using a Wiley mill (Thomas Scientific, Swedesboro, NJ, USA). To determine the carbohydrate composition, the samples were hydrolyzed with sulphuric acid, and the resulting monosaccharides were determined by HPAEC with pulse amperometric detection (Dionex ICS 3000A equipped with CarboPac PA1 column) according to NREL methods (Hausalo 1995; Sluiter et al. 2008). Carbohydrates were calculated in their anhydroform with correction factors of 0.9 for hexoses and 0.88 for pentoses. X-ray powder diffraction (XRD) data of the samples were recorded with a Philips X’Pert MPD diffractometer (Philips Research Laboratories, Eindhoven, Netherlands) equipped with a primary beam and a curved graphite monochromator Cu Kα1 radiation (1.5406 Å; 40 kV, 50 mA). A proportional counter detector, PW3011/10, was used to collect the data in a 2θ range of 5° to 40° with a step size of 0.02°. Peak deconvolution analyses were made with PANalytical HighScore Plus (4.7) program (Degen et al. 2014). The same baseline function and identical peak profile settings were used for all XRD patterns. Peaks were fitted with pseudo-Voigt function with fixed shape parameter (η = 0.6, defining mixing ratio of Gaussian and Lorentzian fraction in pV-function). Due to the high correlation of peak profiles, additional asymmetry functions for each peak profile was not used and peak profile base widths were limited to be 20xFWHM (full-width at half maximum) for each peak. Crystallinity indices were calculated by dividing the afforded peak area corresponding to crystalline pulp by the overall area of the pattern. Crystalline area was determined by overall area subtracted by amorphous content which is indicated by the peak area of the broad peak at ~ 20.2° 2θ. Crystal size estimations were made by the Scherrer equation using the FWHM value of the most isolated peak profile at 22.2° 2θ (Langford and Wilson 1978). Homogenous esterification of the cellulose was performed using the method presented by Willberg-Keyriläinen et al. (2016, 2017). First the cellulose was dissolved in 5% LiCl/DMAc solution and then esterified with palmitoyl chloride (3 or 6 equivalents to each cellulose AGU (anhydroglucose unit)), using pyridine as catalyst. The reaction was carried out at 80 °C for 16 h. The cellulose palmitate was precipitated with ethanol, filtered, and washed with ethanol and acetone. Heterogeneous esterification of the cellulose was also performed using the method presented by Willberg-Keyriläinen et al. (2016). Cellulose and palmitoyl chloride (3 or 6 equivalents to each cellulose AGU) were mixed with an excess of pyridine. The reaction was carried out at 100 °C for 5 h. The cellulose palmitate was then precipitated with ethanol, filtered, and washed with ethanol and acetone. The prepared cellulose palmitates were characterized using solid state 13C CP/MAS NMR spectroscopy (ssNMR) with an Agilent 600 MHz NMR spectrometer (Agilent Technologies, Palo Alto, CA, USA). A 3.2 mm triple resonance magic angle spinning (MAS) probe head was used operating in double resonance mode. For all palmitate esters, 5000 scans were accumulated using 10 s recycle time, 3 ms contact time, and an MAS rate of 10 kHz. All ssNMR experiments were carried out at room temperature. Films were prepared from the purified cellulose palmitates by solvent-casting without an external plasticizer. First, the prepared cellulose palmitates (0.3 g) were dissolved in chloroform (10 mL). The solutions were cast into a Petri dish (diameter 50 mm), and cellulose palmitate films were obtained by evaporating the solvent in air at room temperature. Mechanical properties (elastic modulus, tensile strength, and elongation) of the cellulose palmitate films were determined by using an Instron 4505 Universal Testing machine (Instron, Buckinghamshire, UK) at 25 °C and 50% relative humidity. A 10 kN load cell and a 5 mm/min cross-head speed were used. Five replicate films strips (3 mm x 50 mm) with an average thickness of 60 µm were analyzed. Three different commercial endoglucanase-rich enzyme preparations were examined as pre-treatments for the subsequent chemical modifications. 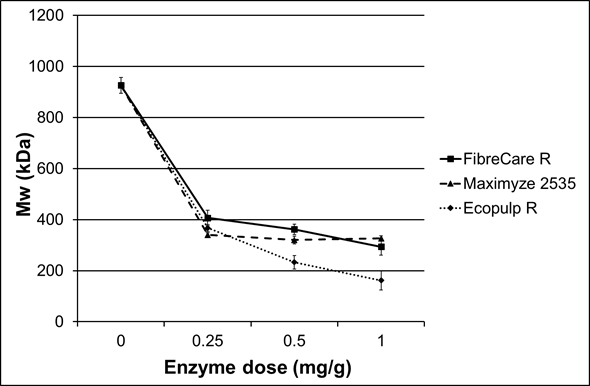 A summary of the enzymatic treatment results is shown in Table 2. All of the enzyme products decreased cellulose viscosity and molar mass to about half of the original values using only the lowest dosage (0.25 mg/g) (Fig. 1). The molar mass of the starting cellulose was 926 kDa. When the FibreCare R and Maximyze 2535 enzyme dosages were increased to 0.5 mg/g and to 1 mg/g, no significant effect on molar mass was observed. However, when Ecopulp R was used, the cellulose molar mass decreased to 233 kDa and 162 kDa with 0.5 mg/g and 1 mg/g enzyme dosages, respectively. At the same time the viscosity of the pulps decreased with the same ratio from initial value of 940 mL/g to 270 mL/g. The differences between the tested preparations were probably due to endoglucanases originating from different microbial species and, hence, having divergent structures and properties. Additionally, the enzyme preparations may have included small amounts of background activities affecting hydrolysis. Since these enzymes are commercial, detailed public product information is not available. The results obtained in this work were consistent with the earlier findings. Henriksson et al. (2005) have used Novozyme 476 and found that the molar mass of cellulose pulp (softwood sulphite pulp) decreased from 420 kDa to 280 kDa when the enzyme load was 50 ECU/g dry pulp. When they increased the enzyme load tenfold (500 ECU/g), the molar mass was not further decreased. Duan et al. (2015) have studied the effect of enzymatic treatment on pulp viscosity. They reported that viscosity of hardwood dissolving pulp decreased from 615 mL/g to 470 mL/g, when 0.5 mg/g enzyme dosage and 2 h incubation time were used. Ibarra et al. (2010) also studied the effect of endoglucanases on the viscosity and the molar mass of softwood dissolving pulp. They concluded that viscosity decreased during one hour from 550 mL/g to 400 mL/g when the enzyme load was 30 ECU/g. At the same time, the molar mass decreased from 560 kDa to 350 kDa. Ozone treatment was performed to create reference pulps for the enzymatic treatments, and the effects of the treatment on molecular mass, viscosity, monosaccharide composition, and crystallinity of the pulps were investigated. The molecular mass of the starting cellulose pulp before the ozone treatment was 926 kDa and, after the ozone treatment, 115 kDa. The viscosity of the ozone treated pulp decreased from the initial value of 940 mL/g to 210 mL/g. Hence, the drop in the molecular mass and viscosity of the pulp was comparable with those of Ecopulp R at the dosage of 1 mg/g. Monosaccharide composition was determined for the untreated pulp, the enzymatically treated pulp (entry 9), and the ozone treated pulp. The results are shown in Table 3. The original pulp contained 26% xylan in addition to cellulose. After the enzymatic treatment, the xylan content remained unchanged, but it was reduced to 20.5% by the ozone treatment. The enzymatic treatment was very specific in hydrolyzing only cellulose and decreasing cellulose content from 67.6% to 64.4%. The amount of liberated reducing sugars (3.3% of the original dry weight) corresponded well with the drop in glucose content. On the contrary, the ozone treatment was not specific and affected the relative concentrations of both cellulose and xylan after the treatment as compared with the original pulp. These observations are well in line with earlier reports by Sun and Cheng (2002). Crystallinity affects the reactivity of cellulose to chemical modification as well as other properties, such as strength. It has been earlier reported (Park et al. 2010; Bernardinelli et al. 2015) that crystallinities can vary depending on measurement methods. Therefore, to see the influence of the enzymatic and ozone treatments on cellulose crystallinity, and thus its reactivity, cellulose crystallinities were measured both by powder XRD using the deconvolution method as well as by solid state NMR (ssNMR). The results are shown in Table 4. According to the powder XRD analysis, using the deconvolution method, the crystallinity index was about 82% for all pulps and no significant differences between pretreatment methods were found. This is in line with earlier results published by Willberg-Keyriläinen et al. (2016) and Puri (1984), in which the ozone treatment had no effect on crystallinity. Enzymatic hydrolysis with endoglucanases has been found to more selectively degrade the amorphous, rather than crystalline, regions of cellulose and, thus increase cellulose crystallinity (Cao and Tan 2002; Engström et al. 2006). However according to the powder XRD results (Table 4), this increase was minimal. The average size of crystallites was calculated using XRD analysis. The estimated crystal size was 3.9 nm to 4.2 nm for all pulps. To confirm this observation, the crystallinities were also measured using the ssNMR C4 peak separation method (Park et al. 2010). In the ssNMR spectra, the peak at 85 ppm was assigned to the C4 carbon in the crystallized part of cellulose and the peak at 79 ppm was assigned to the C4 carbon of the amorphous part of the cellulose. The crystallinity degree of cellulose can be calculated by dividing the area of cellulose crystalline part by the total area assigned to the C4 carbon peak. Based on the ssNMR results (Table 4), ozone and enzymatic treatments did not change the crystallinity of the pulp and the crystallinity index was 56% for all pulps. It is known (He et al. 2008; Park et al. 2010) that crystallinity indices calculated by using ssNMR method show lower values than those calculated by XRD analysis. This is because the peaks in XRD are often quite broad and vary considerably in their width. When ssNMR is used, contributions from both amorphous and crystalline cellulose to the whole NMR spectrum is considered to provide a more accurate measurement (Park et al. 2010). The reactivity of untreated and treated pulps was evaluated using both homogeneous and heterogeneous esterification reactions. Because no differences in the crystallinities were found between the different pulps, the molar mass of the pulp seems to have the largest influence on its reactivity. The degree of substitution (DS) of the cellulose palmitates was analyzed using ssNMR spectroscopy by comparing the cellulose palmitates’ carbonyl carbon (173 ppm) integrals with the cellulose C1 signal (105 ppm) integral. According to the ssNMR, the DS values of prepared cellulose palmitates (using homogeneous method) ranged from 0.3 to 1.2 while those prepared using heterogeneous method ranged from 0.5 to 1.3. The results are tabulated in Table 5. Based on the DS values of the synthesized cellulose palmitates, it was observed that the molar mass of the starting cellulose had a clear effect on the end products’ degree of substitution; DS values increased when molar masses decreased. When untreated pulp with a molar mass 926 kDa was used as a starting material in homogeneous esterifications, the DS was only 0.3 when the molar ratio of palmitoyl chloride to AGU (anhydroglucose unit) was 3:1. However, when the same pulp with a molar ratio of 6:1 was used, the obtained DS was 0.6. When the enzymatic and ozone treated pulps with lowered molar masses were used, the DS values were between 0.9 and 1.2, depending on the molar ratio of the reactant to AGU. Both enzymatic and ozone treated pulps resulted in the same DS, indicating that, when the homogeneous esterification method was used, no differences between pretreatment methods on DS were found. When heterogeneous esterifications were used, both the enzymatic and ozone treated pulps resulted in higher DS values than did the untreated pulp, and the DS values were slightly higher than their corresponding homogeneous esterification values. This same effect has already been reported by Willberg-Keyriläinen et al. (2016). The crystallinity index was the same for all pulps; therefore crystallinity has no effect on DS values. Therefore, the molar mass had a greater effect on the DS than did the treatment method. Accordingly, the ozone treated pulp with the lowest molar mass resulted in the highest DS values. Cellulose palmitates have also been studied earlier. However, in several studies microcrystalline cellulose has been used as a starting material. For example Guo et al. (2012) reported DS value of 0.3 when molar ratio of palmitoyl chloride to AGU was 3:1 and Wei et al. (2007) achieved DS value of 0.7 with molar ratio 5:1. These results are in line with the present results for untreated pulp. The cellulose palmitates made from the untreated pulp were not soluble in chloroform due to their low DS. The molar mass of cellulose palmitates also had an effect on solubility. Cellulose palmitates with low molecular weights have a higher solubilizing susceptibility than do those with high molecular weights. Therefore, a sufficiently low DS is required for solubility in chloroform (Willberg-Keyriläinen et al. 2017). However, the authors have reported in an earlier study (Willberg-Keyriläinen et al. 2017) that DS must be 0.8 or higher to make cellulose palmitates chloroform soluble. Cellulose palmitates prepared via a homogeneous esterification method from enzymatic and ozone pre-treated pulps were formed into films by solvent-casting. These films were flexible, optically transparent, and also heat sealable. Heterogeneous methods modified only the surfaces of cellulose fibers, and the cellulose palmitates were not fully soluble in chloroform, even at a higher DS, due to the uneven distribution of the side chain groups. The mechanical properties, elastic modulus, tensile strength, and elongation at break of cellulose ester films were measured. Detailed values are presented in Fig. 2. All tested cellulose palmitates had similar elastic modulus values (~240 MPa) regardless of pretreatment method or degree of substitution. All tested cellulose ester films were made using the homogenous method, where pulps were dissolved in a LiCl/DMAc solution. Both of the cellulose palmitates prepared using a 3:1 molar ratio of palmitoyl chloride had higher tensile strengths than those prepared using a palmitoyl chloride molar ratio 6:1. The reason might be that, when DS increases, the plasticizing effect of palmitate side chains also increases and the mechanical properties decrease. Additionally, when DS increases, intra- and intermolecular hydrogen bonding between cellulose molecules decreases and strength properties are negatively affected. Park et al. (1993) observed that elongation at breaking and tensile strength of cellulose ester films increased when the molecular weight of the cellulose was increased. In the present study, the opposite phenomenon was observed; higher elongation and tensile strengths were observed when ozone treated pulp were used, and molar mass was lower than when enzymatic treated pulps were used. The same trend was also observed in the authors’ previous research (Willberg-Keyriläinen et al. 2016). The degree of substitution only had a small effect on the mechanical properties of the associated cellulose palmitates, whereas the molar mass of the starting material seemed to have a major effect on the mechanical properties; the lower the starting molar mass, the better the mechanical properties. Fig. 2. The mechanical properties of the cellulose palmitate films (prepared via a homogeneous esterification method) are shown above. A shows elastic modulus (solid bars) and tensile strength (●) and B shows elongation at break. 1. Cellulose molar mass was lowered in a controlled manner using enzymatic treatment. 2. The effect of the enzymatic treatment on cellulose molar mass was dependent on the enzyme preparation and enzyme dosage used. Based on the analysis of the treated pulps, the enzymatic treatment acted only on cellulose, whereas ozone treatment reduced the amount of hemicellulose. 3. According to the XRD and ssNMR analyses, the choice of pretreatment method had no effect on cellulose crystallinity. 4. Both enzyme treated and ozone treated pulps were esterified using homogeneous and heterogeneous methods and the degree of substitution of these pulps were much higher compared to esters in which the untreated pulp was used. Moreover, there was no difference in the chemical reaction between the pretreatment methods. 5. Solvent casting was used to form cellulose esters from the treated pulps into films with good mechanical properties. Funding by Business Finland [grant number 4606/31/2016] is gratefully acknowledged. The authors thank Mari Leino for help with the enzymatic treatments. Carvalheiro, F., Duarte, L. C., and Gírio, F. M. (2008). “Hemicellulose biorefineries: A review on biomass pretreatments,” Journal of Scientific & Industrial Research 67, 849-864. Degen, T., Sadki, M., Bron, E., König, U., and Nénert, G. (2014). “The HighScore suite,” Powder Diffraction Journal S2, S13-S18. Eqra, N., Ajabshirchi, Y., and Sarshar, M. (2014). “Effect of ozonolysis pretreatment on enzymatic digestibility of sugarcane bagasse,” Agric Eng Int: CIGR Journal 16(1), 151-156. Ghose, T. K. (1987). “Measurement of cellulase activities,” Pure and Applied Chemistry 59(2), 257-268. DOI: 10.1351/pac198759020257. Hausalo, T. (1995). “Analysis of wood and pulp carbohydrates by anion exchange chromatography with pulsed amperometric detection.,” in: The 8th International Symposium on Wood and Pulping Chemistry, Vol III. June 6-9, Helsinki, 131–136. Heikinheimo, L., Cavaco-Paulo, A., Nousiainen, P., Siika-aho, M., and Buchert, J. (1998). “Treatment of cotton fabrics with purified Trichoderma reesei cellulases,” Journal of the Society of Dyers and Colourists 114, 216-220. ISO 5351-1. (1981). “Cellulose in dilute solutions — Determination of limiting viscosity number — Part 1: Method in cupri-ethylene-diamine (CED) solution,” Internal Organization for Standardization, Geneva, Switzerland. Krässig, H. A. (1993). Cellulose, Structure, Accessibility and Reactivity, Gordon and Breach Publishers, Amsterdam. 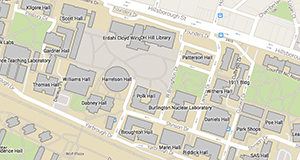 Liu, J., Otto, E., Lange, N., Husain, P., Condon, B., and Lund, H. (2000). “Selecting cellulases for bio-polishing based on enzyme selectivity and process conditions,” Textile Chemist and Colorist and American Dyestuff Reporter 32(5), 30-36. Lowry, O. H., Rosebrough, N. J., Farr, A. L., and Randall, R. J. (1951). “Protein measurement with the Folin phenol reagent,” The Journal of Biological Chemistry 193(1), 265-275. Park, H. J., Weller, C. L., Vergano, P. J., and Testin, R. F. (1993). “Permeability and mechanical properties of cellulose-based edible films,” Journal of Food Science, 58(6), 1361-1364. Pere, J., Siika-aho, M., Buchert, J., and Viikari, L. (1995). “Pere effect of purified cellulases on kraft pulp.pdf,” Tappi Journal 78(6), 71-78. Puri, V. P. (1984). “Effect of crystallinity and degree of polymerization of cellulose on enzymatic saccharification,” Biotechnology and Bioengineering XXVI, 1219-1222. Sixta, H. (2006). “Pulp properties and applications,” in: Handbook of Pulp, H. Sixta (ed. ), Wiley-VCH Verlag GmbH & Co KGaA, Weinheim, pp. 1009-1067. Sluiter, A., Hames, B., Ruiz, R., Scarlata, C., Sluiter, J., Templeton, D., and Crocker, D. (2008). “Determination of structural carbohydrates and lignin in biomass: Laboratory Analytical Procedure (LAP).,” in: Issue Date: 4/25/2008. NREL/TP-510-42618. Wei, Y., Cheng, F., and Hou, G. (2007). “Synthesis and properties of fatty acid esters of cellulose,” Scientific and Industrial Research 66, 1019-1024. Article submitted: August 30, 2018; Peer review completed: November 11, 2018; Revised version received and accepted: November 22, 2018; Published: November 28, 2018.